So it’s 1st March 2018……and today is my 6th anniversary of becoming vegan! You may have noticed veganism seems to have hit the headlines lately here on Planet Earth! There has been a wave of media interest in the last few months and I think it would be right to say that there is a palpable tingle running through the worldwide plant-based community at the moment as the vegan issue is gaining momentum and our fellow humans are starting to wake up and smell the coffee or shall we say….the stench from the sickening slaughterhouses as more and more animals are bred and killed to sate human desire for flesh. So – I became veggie aged 12 when our dog Ferne got into our garden and attacked and killed Jenny, my rabbit. She was out on the lawn enjoying the sunshine and our Golden Retriever (who was supposed to be locked inside) literally grabbed her and shook her to death – jaws clamped tight on her little limp grey neck. After naturally being devastated, it dawned on me that I was absolutely no different from the dog who acted on his animal urges to kill and eat. So I decided that day that I had a choice…….and had the ability to choose not to kill animals any longer. Sure, I didn’t personally pick up defenceless rabbits and shake them to death, but in order to eat ‘meat’ * there were other humans killing those pigs for me so I could have my bacon sarnie. No more death for my dinner I said and 27 years passed as a vegetarian…. All through those 27 years, I was aware of how animals were still being killed for my cheese, eggs and milk but like many people, I pushed this from my mind, particularly as I thought ‘I am making my contribution not eating meat’. 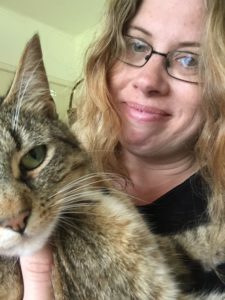 When I met the lesser spotted vegans (like once every 5 years!) their diet seemed radical, extreme and unattractive. Things started changing a few years ago, through my political work as a Green Councillor. I started meeting many more environmentalists, and with that more vegans seemed to enter my life. I also kept chickens for a time and that was a real education in itself on the farming industry. Something often put to vegans is that we know nothing of rural living and farming – well I grew up in rural Durham and North Yorkshire and I now live in Devon and ‘keeping’ chickens is the main reason I stopped eating eggs. 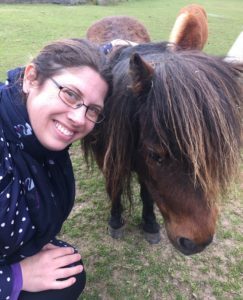 So…moving on, a lovely friend of mine called Sharon who runs Exeter Friends for Animals was organising a Vegan Pledge month through March and I signed up to give it a try – fully knowing that if I ever went vegan there would be no going back for me. It was an amazingly supportive life-changing month going to talks, learning about veganism, enjoying the vegan lunches they put on, making new friends etc. I’d say now, 6 years on that being part of an incredible worldwide community of like-minded individuals, I feel much more knowledgable and confident as a herbivore than when I started. There’s a bit of a saying amongst us non-carnivores “Now I’m vegan I wish I’d done it years ago”. We all realise it was a huge leap but one where the grass really is so much greener and we feel it gives us such a lighter conscience and (sorry everyone) the urge to tell others it’s so much sunnier on the other side! So Happy Anniversary to me and to all the animals that have not died the past 6 years so I can eat cheese, milk and eggs continuing as a veggie. *I don’t like using the word ‘meat’ as it serves to disconnect us from what it is. These are sentient beings, creatures, animals (just like us). Next post: Moo Free Chocolate Giveaway! Happy 6th anniversary 🙂! Moved by your blog post on how you became vegan. I had a vegan friend I’d invited to dinner for a catch up, being a total foodie I wanted to make all the food suitable for her, brought “Veganomicon”. Then I watched “Cowspiracy” on Netflix and by the end I was vegan. 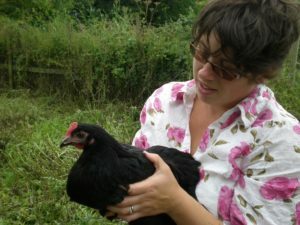 My partner and I now have rescue hens and I tend to look after them now as I work from home. One died a few weeks ago, it broke our hearts, felt silly for crying in the vets, but realising she would never see the sun again, snuggle with her friends, get excited about the treats we feed them. Just so grateful she was saved from the misery of farming and lived a happier life, loved and cared for. The vegan life is the only life.